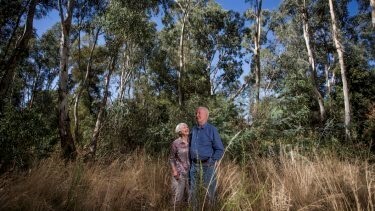 In a major act of biodiversity kindness and long-term vision, local residents Caroline and Terry Bellair have donated savings of $1 million to Bush Heritage Australia to convert private property into nature reserves and help create habitat links for plants and animals to adapt to a changing climate. Terry and Caroline are members of Friends of Campbells Creek Landcare and cherish their local environment and the achievements of their active Landcare group. Some of the inspiration for the couple came after hearing Jeroen van Veen from Bush Heritage talk at an event organised by Connecting Country in Campbells Creek in 2018, called ‘Planting for the Future’ – part of our ‘Future-Proof your Restoration’ series. This event featured three guest speakers on the topic of adapting to a changing climate (click here for details). Jeroen spoke about Bush Heritage’s private property conservation program and some of the amazing outcomes the organisation has achieved through purchasing private properties with high conservation value. For example, Bush Heritage is working to link up isolated bits of habitat around St Arnaud and Wedderburn in northwest Victoria. Habitat fragmentation is a huge conservation challenge, with many areas of forest cleared for farming and mining, resulting in small, disconnected habitat havens and climate refuges. The day after the Connecting Country event, the family began the process of donating a million dollars to Bush Heritage. The original plan was a bequest in their will, but that was soon changed to an immediate donation, allowing them to see the impacts of the Bush Heritage purchase. Over 15 years, Bush Heritage has bought more than 1,500 hectares to connect habitat in the Kara Kara-Wedderburn Landscape. Bush Heritage also hopes to buy another nearby block with the Bellair donation, on top of the 203 hectare block near Emu, which will help form a chain between Wedderburn and the Kara Kara National Park. For more information on the Bellair’s generous donation, click here.